Citation: C N Trueman "Henry VII and Europe"
Henry VII needed to develop a positive relationship with the major states in Europe if he was to maintain credibility as a king. Henry also needed leaders in Europe to stop pretenders to the throne from congregating in their states and he could only achieve this by developing good diplomatic ties with the likes of France and Spain. When Henry became king in 1485, he was in no position to adopt an aggressive foreign policy. The War of the Roses had reduced England’s manpower and Henry simply did not have the financial resources to embark on a robust foreign policy. He had to concentrate on domestic issues such as establishing himself as a ruler free of any internal threats. As a result of this, Henry could not spend too much time concentrating on foreign policy. It was noted that Henry was more inclined to peace rather than war. 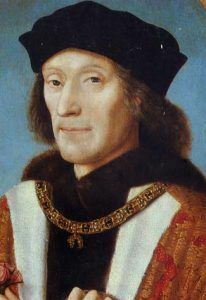 The nearest country to present Henry VII with potential problems was France. England and France had been major rivals since 1066 and had clashed over English-held land in France for many years – the most acrimonious being the Hundred Years War from 1337 to 1453. By 1485, France had nearly become one cohesive state. The semi-independent feudatories that had existed were now by and large absorbed into the state. By the time Henry was victorious at the Battle of Bosworth, France had three times the resources in terms of manpower and revenue. The mere proximity of France made it a natural gathering place for those opposed to the Tudors. One of the first things that Henry did after Bosworth was to sign a one-year’s truce with France that was later extended to 1489. However, Henry faced a very real problem with regards to France and Brittany. Both had helped Henry in bygone years. Brittany had been Henry’s primary base during his exile while France had helped to finance his campaign against Richard III. Brittany was the last independent area within France and was governed by the ageing Duke Francis, who had been a generous hosted to the exiled Henry. The regent of France, Anne of Beuajeau, had decided that the best way to resolve the issue of Brittany’s independence was to marry her eight-year old brother, Charles VIII, to Anne – the twelve-year old daughter of Francis and heir to Brittany. Clearly, this was something that the Bretons would not accept as it would put them directly under the control of France. Matters became more complicated when the recently widowed King of the Romans, Maximilian, stated his intention of marrying Anne of Brittany. Henry did not want to upset either France or Brittany but ended up sending 6,000 ‘volunteers’ to Brittany to defend the Bretons against the French. However, the Bretons could not hold out against the French and in December 1491 they accepted defeat. Anne married Charles VIII and the marriage ended Brittany’s independence. It was now that Henry believed that it was prudent to adopt a more aggressive foreign policy. It is almost certain that Henry knew that France was more interested in expanding her influence and power in northern Italy. He announced his intention to assert his claim to the French throne. Parliament voted two subsidies that paid for a substantial force of 26,000 men. They crossed the Channel in October 1492 and besieged Boulogne. The advisors of Charles VIII wanted rid of Henry to leave them free to concentrate all resources in north Italy. The result was the Treaty of Étaples (November 3rd 1492). Henry received a promise from Charles that he would no longer give any assistance to any pretenders to the English throne. Henry also received a total of 745,000 crowns – the cost of the venture – to be paid at 50,000 crowns a year. This amounted to about 5% of Henry’s total annual income. Spain presented Henry with a different set of problems. Aragon and Castille had united in 1479 and was the dominant power in the Western Mediterranean. Henry wished to see greater English trade in the Mediterranean and Spain could have seen this as a threat to their status in the region. However, rather than antagonise Spain, Henry saw the country as a very useful counter-weight on the southern border of France. The logic behind the Treaty of Medina del Campo (1489) was to tie England and Spain closer together via the marriage between Prince Arthur and Catherine of Aragon. When the negotiations started, Arthur was barely three years old and six months younger than Catherine! The main point of contention was the size of the dowry that Catherine would bring with her. The other issue was the fear in Spain that Henry was not as secure on the throne as they would wish. The signing of the treaty was a success for Henry as it gave legitimacy to his rule from one of Europe’s most powerful nations. When Catherine finally arrived in England in 1501, she brought with her a dowry of 100,000 crowns. The sudden death of Arthur in April 1502 gravely upset Henry’s plans. However, in June 1502, Ferdinand and Isabella of Spain gave their blessing to the marriage between Prince Henry and Catherine – though this would have required a Papal dispensation as Catherine was seen as being related to Prince Henry. But relations with Spain took a major downturn in February 1503. Queen Elizabeth died and aside from his own personal grief, Henry faced a very real problem. Two of his three sons had died and understandably, he had fears for Prince Henry who was keen on what might be seen as dangerous sports. To ensure that the Tudors had a surviving male heir, it seems that Henry wanted to find a new wife. This, ironically, led to a clash with Ferdinand whose wife, Isabella, had died in 1504. With two kings seeking a wife, and the options open to them being limited, the two former allies were on course to becoming major rivals. Henry never remarried but he tried to develop closer ties with Burgundy. This pushed Ferdinand into the arms of the French and he married Germaine de Foix, the niece of Louis XII, in October 1505. With Spain and France now linked by marriage, Henry was in a vulnerable position. Scotland was a potential source of trouble for Henry. While they had been favourable to Henry at Bosworth, he could not guarantee that this would always be the way. In July 1486, Henry signed a three-year truce with the Scots. In 1488, James III of Scotland was assassinated and James IV – a fifteen year old, succeeded him. With such a young king on the throne, Henry believed that the Scots had more domestic issues to deal with rather than become a thorn in the side of England. Scotland’s support for Perkin Warbeck was directly aimed at Henry and the marriage between Warbeck and the cousin of James IV was seen as a major threat to the king of England. The fact that the Warbeck rebellion petered out did not disguise the part played by Scotland and Henry, realising how vulnerable the border was, was keen for a truce with the Scots. In 1497, the Truce of Ayton was signed and after the execution of Warbeck it became a full peace treaty. While this may have seemed as if Henry was desperately seeking peace on his northern border, it has to be remembered that there had been no such agreement between Scotland and England since 1328. In August 1503, Henry’s eldest daughter, Margaret, married James IV to bring both countries even closer together. In January 1487, Henry renewed a treaty with the King of the Romans, Maximilian, the heir to the Holy Roman Empire. In 1496, England also joined the Holy League formed to force France out of northern Italy. However, Henry only signed on the condition that England did not have to go to war with France and at the same time he signed a commercial treaty with France. How successful was Henry’s foreign policy? From a position of extreme vulnerability in 1485, he had acquired a decent reputation abroad by the time of his death. Even though England was not part of the League of Cambrai (1508), the members of the League stated that they would not threaten England’s interest abroad. As well as being a wily diplomat, Henry also had luck on his side. For a number of years during his reign, the major powers of Europe were more concerned about events in northern Italy, an area where England had minimal interests. Therefore, Henry was given more of a freer hand than he might otherwise have expected. Polydore Vergil wrote that Henry was “fortunate” and in many areas of foreign policy he probably was.